A Salad of Winter Roots – Dig Delve – An online magazine about gardens, landscape, growing & making. At the height of summer, when all you want to be eating are salad, peas, broad beans and cucumbers, it is easy to resent the space taken up by the winter vegetables. But the time spent sowing, weeding, hoeing and watering them through the hot months is amply repaid come this time of year. 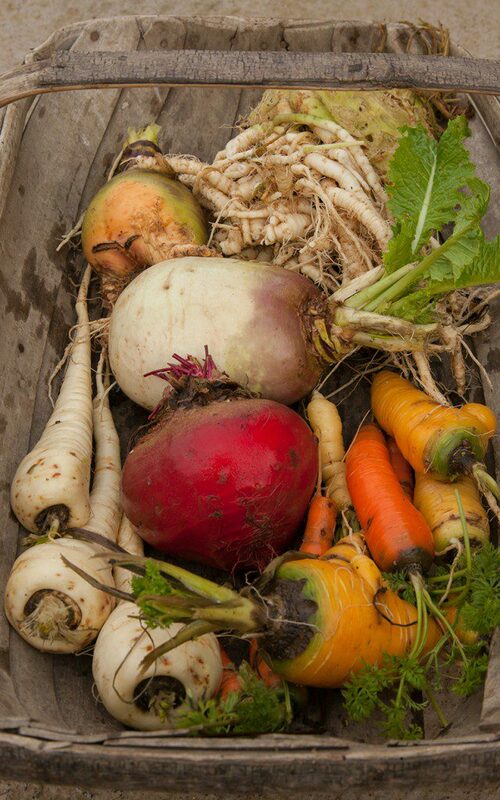 We have been eating beetroot, parsnips, turnips, swedes, celeriac and carrots for several months now and, together with our stored potatoes and onions and a wide assortment of brassicas, we have been almost self-sufficient for vegetables. The greengrocer only sees me if I need lemons, oranges or some of the more exotic fruits available at this time of year like pomegranates, persimmons or Seville oranges. The brassicas and roots are our winter bounty but, although we have enjoyed the hearty roast vegetables and mash, there comes a point when we pine for a crunch and for fresh, clean flavours. Without a polytunnel or greenhouse winter salad hasn’t been possible here yet, and I refuse to buy tasteless bags of salad so we rely upon the radicchio and chicory that were sown last spring, eaten in the summer and then left in the ground. We always miss the chance to sow them for a winter harvest, but these rogues from the summer are hearting up now, and add to this salad of raw winter roots. The freckled leaves of ‘Castelfranco’ make a pretty addition to the plate, but any of the more common dark red forms would provide a dramatic contrast. The wider a variety of shape and colour you can get in your selection of vegetables the more attractive the salad will look. Here I have used the striped beetroot ‘Chioggia’ and orange ‘Burpee’s Golden’. The varied colours of heritage carrots also add to an appealing mix. The balance of sweet, savoury, earthy, bitter and peppery flavours provided by the vegetables selected here makes for a varied eating experience, but the salad could be made with any combination of three of the roots if you do not have access to them all. Thinly sliced fennel would also be a good addition and, although the frost has ravaged our winter crop of bulbs, the remaining foliage is still delicious for its aniseed flavour and addition of green. Radish, mooli or kohlrabi could also be substituted. Seville oranges are just coming to the end of their season. When unavailable replace with a 50/50 mix of lemon and orange. This salad is particularly good with roast chicken, roast pork, sliced ham or a cold chicken and ham pie. First prepare two bowls of iced water. Add the lemon juice to one of them. Trim and peel the carrots and parsnip, then shave thin ribbons off the length of each with a vegetable peeler. Put them all into the bowl of plain iced water. If you are using dark red or purple carrots put them in a separate bowl of iced water. Trim and peel the beetroot. Using a mandolin or very sharp knife slice as thinly as possible into rounds. Striped or pale coloured beetroot (orange, yellow or white) can be added to the water bowl containing the carrots and parsnip. Purple beetroot will need a separate bowl of iced water or can be added to that containing the purple or red carrots. Peel the turnip and swede and grate coarsely. Slice the apple as thinly as possible and put into the bowl of acidulated water. Peel the celeriac. Cut into slices about a centimetre thick. Using a mandolin or very sharp knife slice as thinly as possible. Add to the bowl of acidulated water. Remove the leaves from the radicchio and tear the soft part of the leaves away from the coarse ribs, which aren’t used. Tear the leaves into pieces roughly 4cm square. To make the dressing put the egg yolk in a bowl, whisk with a fork, then add all of the other ingredients and whisk again until well combined. Taste for seasoning. You may need to add more honey, salt or horseradish to taste. The dressing needs to be fairly strongly seasoned as the flavour is diluted once mixed with the salad. Finally stir in the finely chopped parsley. Heat a small heavy frying pan. Add the walnuts and allow to scorch on one side. Remove from the pan and allow to cool. Drain the vegetables and apple and pat dry on a clean tea towel. Put in a large bowl. Keep the dark roots to one side. Add the radicchio and fennel fronds to the bowl. Using your hands toss the salad very gently to distribute the different vegetables evenly. Pour over two thirds of the dressing and use your hands again to gently mix the salad ensuring everything is well coated. Add more dressing if required, however the vegetables should just be lightly coated, not swimming. Now add the dark beetroot and carrots and toss the salad again very quickly to avoid turning the whole salad pink. Transfer the salad to a serving plate or divide between individual plates. 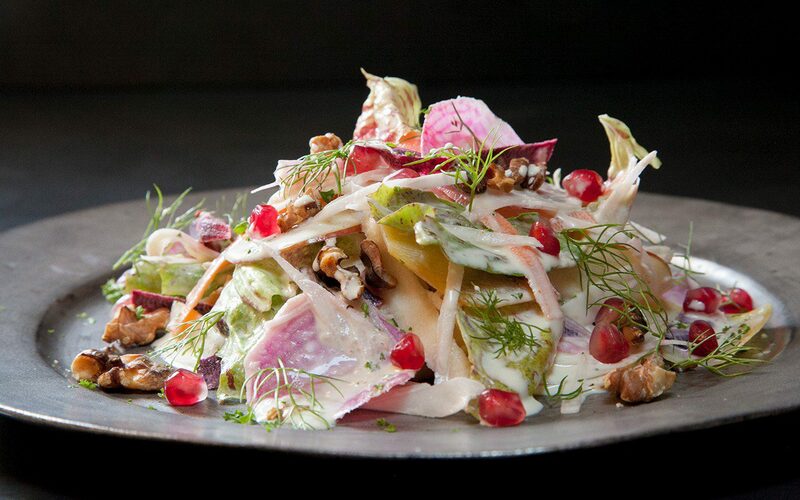 Spoon on a little more dressing then scatter over the pomegranate seeds, scorched walnuts and reserved fennel fronds.